Gun companies walk a very fine line in advertising weapons. In recent years the delicate nature of selling a deadly product to a mass audience has kept gun ads away from mainstream outlets like newspapers or television, as HuffPost's Tom Zeller recently pointed out. But once upon a time, the nation's gun makers didn't need to be so sensitive. 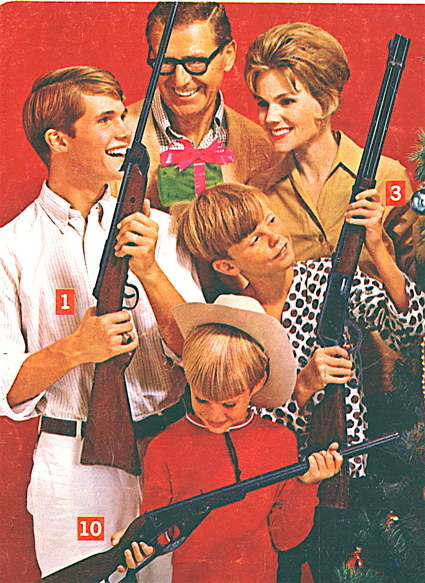 A scan of vintage firearm and air rifle ads reveals a world in which guns were a must-have for the whole family. <i>A Christmas Story</i> <a href="http://www.creativepro.com/article/scanning-around-with-gene-gun-for-the-whole-family">this is not</a>.